That’s what Admiral William McRaven said 11 days after Judicial Watch FOIAed for pictures of Osama bin Laden’s remains. As I was the first to note back in June, McRaven ordered that all photos in JSOC’s possession should be purged. According to the IG Report where I first noted that order, he ordered them be sent to CIA (the final IG Report censored that reference). I thought at the time (and still believe) it was an attempt to jurisdictionally sheep dip the pictures, just as the operation had been, to get further protection for the pictures. It’s only now, after Judicial Watch lost their suit to obtain these photos, that DOD has gotten around to providing this document that makes it clear McRaven ordered the photos not just purged, but “destroyed” after the Judiical Watch request. Congratulations to the AP, which has caught up to the reporting I did a month ago on the way SOCOM purged their own systems of Osama bin Laden photos (and, apparently, records) and moved them to the CIA. But it appears that this shell game involved more than just moving all these records to CIA. 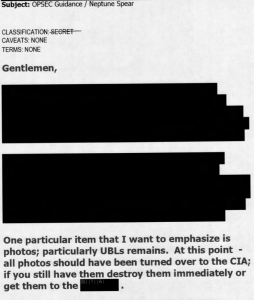 It appears CIA had to retroactively classify at least the photographs. The search, particularly at DOD, was inadequate. The government declarations didn’t adequately specify what was included in the pictures (I suspect this was done to hide trophy pictures not shown to Congress or, possibly, even the President). The government declarations don’t prove that all the photos could cause exceptionally grave harm. The description of the classification process was inadequate. It is the last of these that is most interesting, given the apparent fact that DOD transfered all its photos to CIA (plus my suspicion that a lot of these are trophy photos, not official operational photos). First, Defendants fail to identify who classified the records. Director Bennett testifies as to who generally has the authority to classify information as TOP SCERET and who generally has the authority to delegate such authority. Bennett Decl. at ¶¶ 14-15. In addition, Director Bennett states that the “Director of the CIA has delegated original TOP SECRET classification authority to me. As an original classification authority, I am authorized to conduct classification reviews and to make original classification decisions.” Id. at ¶ 18. Yet, Director Bennett does not testify that he personally classified the records. Nor does he state that any other authorized official actually classified the records. If an individual without the proper authority classified the records, Defendants have not complied with the procedural requirements of EO 13526. Most of the coverage of Admiral William McRaven’s letter to the special operations community telling them to shut up has focused on McRaven’s insinuation that the recent flurry of activity stems entirely from a desire for personal or political gain. But I find McRaven’s comments about what forms of publicity about special ops are appropriate just as interesting (thanks to Josh Rogin for linking a copy). McRaven notes the importance of books on special operations as a learning tool. Most of these books were wonderful accounts of courage, leadership, tough decision making, and martial skill all of which benefited me as I tried to understand of our past and how it could affect missions in the future. Movies that portray the heroics of service members are also well worth watching and often provide the public insights into life in special operations or the service that can’t be garnered anywhere else. Countless stories have been told through the medium of film that needed to be told and I am thankful that they were. Now, I’m grateful that McRaven has criticized OPSEC’s attempt to politicize the Osama bin Laden raid (though it does suggest a double standard). But these comments are rather troubling. First, note that McRaven’s thesis depends on at least two first person narratives of special ops soldiers–those of Otto Skorzeny and Jonathan Netanyahu (though Netanyahu’s consists of his letters published after his death). So McRaven’s citation of his thesis hardly discredits Matt Bissonnette’s decision to publish his own first person account of his SEAL exploits. Of course, in doing so McRaven also suggests that fictional stories are all taxpayers should learn about these “stories that need to be told.” Not just fictional ones, either, but sensational ones. The better to inspire a future head of SOCOM to join the military, just like John Wayne did for McRaven! Of course, that says taxpayers should only have a false understanding of the wars being fought in their names, which is a profoundly contemptuous view. I have no idea whether Bissonnette’s narrative will be accurate (the Pentagon has gotten a copy and is reading it now, so they may seize it before we get to see). But if it is accurate, why should a Hollywood movie be a more valid telling of the OBL story than the kind of firsthand account McRaven himself has relied upon? Plus, by endorsing sensational Hollywood narratives, McRaven effectively endorses the kind of special ops hero that would, himself, seek publicity. You can’t have Hollywood serve as the legitimate venue for discussing special operations without feeding the system that would lead a SEAL to want to write his own book and sell the rights to Steven Spielberg. Hollywood created the market for such books; you can’t expect veterans not to feed it. If the Commander of SOCOM believes the stories of special ops need to be told, then he should declassify them so they can be told in a format that is factual, sober, and complete. This endorsement of Hollywood flicks–while it may serve the Administration’s immediate interests–makes the Administration’s abuse of information asymmetry even worse. It defends not only the Administration getting exclusive control over how to the tell the stories, but suggests it should do so using fictional and sensational means.